I had another great hunt with CMS! Back in January at DSC I booked a 14 day buff/sable hunt with Alan Shearing as the PH. We were hunting Dande East, and, despite a huge fire which came in from Mozambique, we had all the animals on my list in seven days. We ended up going to Dande North and doing some tiger fishing and spending one night in the Motambo camp. I was fortunate enough to catch a 12 pound tiger on our last evening of fishing. It was a great trip and I am looking forward to going back in 2020! "Build a man a fire, and he'll be warm for a day. Set a man on fire, and he'll be warm for the rest of his life." Terry Pratchett. Well done Lee. Thanks for sharing. Well done. I know exactly where you caught that tiger! Dande East is an incredible success story. I think I know where that tiger was caught too! Well done on the hunt. Great report and superb trophies! Thanks for posting. Give me the simple life; an AK-47, a good guard dog and a nymphomaniac who owns a liquor store. Beautiful kudu! And buff. Thanks for the write up. I’m leaving Sunday for a buff hunt with Buzz. Can’t believe it’s finally arrived. 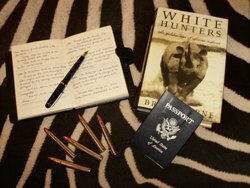 First trip to Africa!!! Fantastic! Nice buff and great to see quality kudu and sable. Alan is an excellent hunter and a super nice guy. Thanks to everyone! As to the location of the tiger fish, it is pretty easy to spot if you've been on that part of the river. The hill on the right side of the picture is the southern portion of the Gateway to the Gorge. Great trophies! Been there as well. Is that a Sharpes Grysbok? If so, all I can say is WOW! Thanks! He is a common duiker. I guess he does look kind of grysbokish in that picture though. Does anyone have a recommendation for a good place to get a tiger fish replica here in the States? I found several on Google, but don't have any experience in that area. I had mine done by Life Form Taxidermy in South Africa. Replica of a 14 pounder. Wonderful Trophies!!! I need to get one of those Tiger Fish Mounted!!! Golf is for people that don't know how to Hunt and Fish. Thanks LHook7. I have more people ask me about the Tiger fish mount than just about anything else in the trophy room, and I've got a lot of interesting mounts! They especially love the teeth! It was great to meet you, Dale. Sorry about the leopard, but I am jealous of the great crocodile you got! Love the sable! Such beautiful antelopes! I came back to this topic as I thought there was a picture of a bunch of hyenas and somebody had asked what was up with that. I was wondering about it as I can imagine there was a really neat story to it. I might be in the wrong topic though, but can't find it anywhere now? Thanks! CM really looks after their areas and clients, great reports all over.